Learning management systems are becoming integral with training staff and students, however many learning management systems do not have an easy to use Quiz maker. This is where ClassMarker plays an important role, offering integration options that are beneficial for both Business and Education. 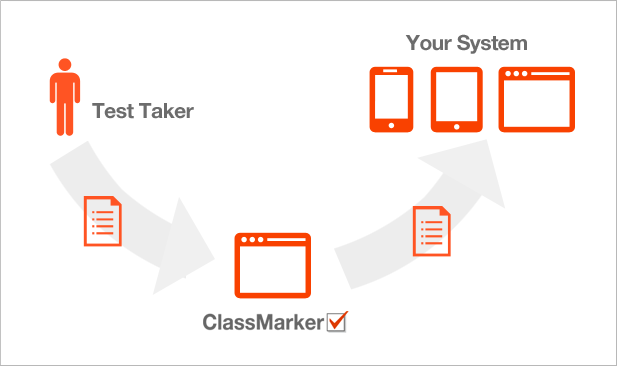 The advantage of integrating your LMS with ClassMarker is the ease in which you can pass your users details and user ids to ClassMarker and have them returned with Test results to record and reference back in your LMS. Users will not have to register for multiple websites just to take their online Exams. Keep your users on your website. Using an LMS can save you time and money. Easily track the progress of your employees/students with results in real time on your website. Flexible access for your Test-takers. Embedding quizzes: You can embed quizzes directly into your website with your own branding. By branding your Tests with your own company logos, background images, etc., this will allow you to create custom quizzes. This will allow users to remain on your website. As well, when you embed the Exam in your website or LMS, this will then hide the classmarker.com URL, branding your Tests even further. Pass LMS User Ids to ClassMarker: Your users will no longer have to register on multiple sites just to take their online exams. This will save you and your users not only time but frustration of multiple logins. Just imagine when you create online training courses, how much easier it will be with single sign on for your users. Less time on registration means more time on training. See: Integrating an LMS with a Quiz maker for more details. Basically, you can send your LMS User IDs to ClassMarker when your test-takers start a test, and then have your system retrieve results back for you (using our Webhooks or API options) to use how you require in your LMS. Webhooks: When using Webhooks, quiz results are automatically sent to your website in real time, upon test completion. With an API, there is a request and response. Whereas, with Webhooks, the request is not required, results are instead sent to your website automatically. API: ClassMarker Exam maker API offers an API which will allow your website to request quiz results automatically. This means you can set your LMS to read available Tests in ClassMarker and assign them to users to take via your LMS directly. Download our Quiz API Integration Guide. If you are looking for a seamless Integration between your learning management system and a stable, secure online testing tool - check out ClassMarker. We offer a full 30 day trial and all upgraded features. We don't hold anything back, we want you to test it all. Feel free to contact our customer support team, who are always available 24 hours a day, 7 days a week to answer your questions, provide solutions or even just pass along a suggestion as to different ways you are able to customize your tests.